Dolphin Bay has been investigating the best methods of processing and disposing of our clients’ CCA waste in instances when the concentrations of contaminants in the leachate surpass the limits accepted by licenced landfill sites. With the help of two engineering students and waste expert Dr Dave Baldwin, we have reached the conclusion that cementation is the best way forward. Properly formulated combinations of cement and additives such as coal ash will stabilise any contaminants and solidify the waste, making the material acceptable for disposal. This is an internationally recognised means of hazardous waste treatment, although Dolphin Bay will be the first company to introduce it to the South African timber treatment industry. Our research follows the introduction of stricter regulations governing waste treatment and disposal, as the authorities increasingly enforce the principles of “reduce, re-use and recycle” and implement stricter controls over the level of contaminants that can be disposed to landfill. These days, only CCA waste with marginal levels of leachate passes the tests at hazardous waste landfill sites. Properly formulated combinations of cement and additives will stabilise any contaminants and solidify the waste. Students Marli de Lange and Christiaan Rabie investigated the issue during their practical work at Dolphin Bay over the December-January period. They visited a client’s plant to assess the nature and concentrations of typical batches of waste, researched the best methods available and, finally, discussed their conclusions with Dave and the Dolphin Bay team. Dave’s many roles include having been the lead hazardous waste consultant in the drafting of the latest regulations for waste classification and disposal at landfill sites in South Africa. “Our regulations are largely based on the Australian approach, as their industries are similar to ours,” he told the Dolphin Bay Brief. “Cementation is used all over the world and, for a chemical like CCA, is the best way to go, both to protect the environment and for reasons of cost. Christiaan is in his third year of Mechanical Engineering, and Marli in her third year of chemical engineering, both at Stellenbosch University. With Dolphin Bay’s help, they completed a trial project, stabilising a sample of the waste and letting it cure for about a week. Dave then helped inspect it and prepare it for analysis. “If our clients are satisfied with our procedure of cementation, this will definitely be a viable solution for hard-to-dispose-of waste,” said Bertus. Waste needs to undergo preparation before the cementation that stabilises it. 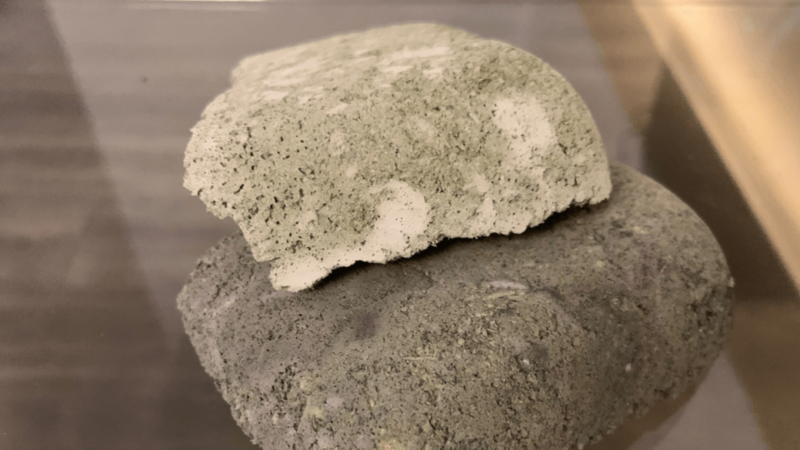 A sample of the cemented waste product is always analysed to confirm that the product is stable and meets the required standards, before it is disposed of. Once the correct formulation is found for a particular waste stream, it will be mixed with the cement in a drum and allowed to solidify. A small sample will be taken and, provided it passes the leaching test, the drum will be closed and taken to the landfill. “We knew we simply had to find a solution, and if cementation hadn’t worked, we would have persevered until we had found something else,” said Christiaan. Both Marli and Christiaan intend to work as engineers for a few years, then study and move into business management, to “combine the engineering way of thinking with business.